I'd been curious about NARS Lip Lacquer in Baby Doll for quite some time before I tried it. The shimmery pale pink hue, the chic pot, the gooily delicious texture. So I was truly hoping my hopes would not be dashed when I finally got my hands on a tub. And you know what? They so weren't. While the cotton candy pink shade is a bit too pale for me to wear on its own, it looks AH-MA-ZING layered over other lipsticks and glosses. It adds that right touch of punchy flirtiness to every single look! 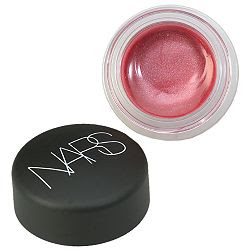 NARS Lip Lacquer in Baby Doll retails for $24 at beauty.com.